For high quantity orders, please call 888-254-5290 for a price quote. You now qualify for $34.99 OFF on your order! Your discount is applied for this product. 42 Inch Arc Promotional Vented Graphite Crown Umbrellas are featuring a Graphite upper vent with bright colored lower vent options such as Lime Green, Orange, Red, White and Royal Blue. Automatic opening, extra-strong Black metal shaft and rubberized matching sure grip handle are other features of these custom auto open/close umbrellas with 5"H x 7"W imprint area. Best for creating a stylish brand image, fashion stores and sports stores can make these umbrellas their promotional gifts to users. Order these custom umbrellas today to grab our free professional design and free online proofs facilities. Request a quote to know what you can save on ordering 42 Inch Arc Promotional Vented Graphite Crown Umbrellas. Whoa! This is really amazing. I fell in love with the product, the very moment I glanced on it. The purchase process was very smooth as compared to many of my earlier experiences. Three cheers to you guys, keep it up with good work. Umbrellas were never cheaper than this! I am happier to have ordered it from you. Thanks guys for your quick response and service. My friend Ethan, who runs a cosmetic parlor is planning to order it from you. Can I see the artwork before it gets printed on an umbrella? Yes, you can see it. We will send you free online design proof to your email id within 24 hours of ordering. Do you offer rush service for promotional umbrellas? 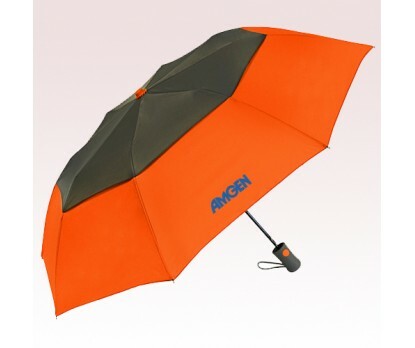 Yes, we do offer rush service for certain types of promotional umbrellas. Please check the section 24 hour services to know more about the same. Do you offer free set up? Yes, we do offer free first color set up.